The Will of a People: A Critical Anthology of Great African American Speeches, a critical anthology of African American Speeches published by SIU Press. Edited with Introductions by Richard W. Leeman and CLA Communication Studies Professor Bernard K. Duffy. 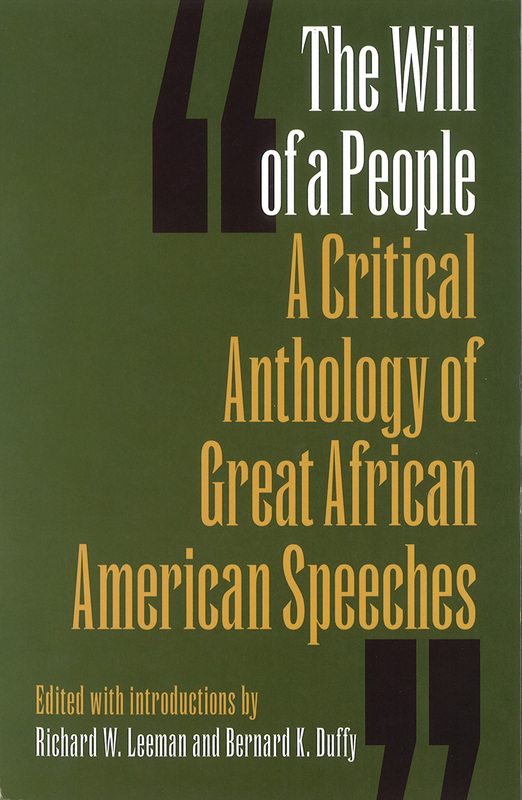 Drawing upon nearly two hundred years of recorded African American oratory, The Will of a People: A Critical Anthology of Great African American Speeches, edited by Richard W. Leeman and Bernard K. Duffy, brings together in one unique volume some of this tradition’s most noteworthy speeches, each paired with an astute introduction designed to highlight its most significant elements. Arranged chronologically, from Maria Miller Stewart’s 1832 speech “Why Sit Ye Here and Die?” to President Barack Obama’s 2009 inaugural address, these orations are tied to many of the key themes and events of American history, as well as the many issues and developments in American race relations. These themes, events, and issues include the changing roles of women, Native American relations, American “manifest destiny,” abolitionism, the industrial revolution, Jim Crow, lynching, World War I and American self-determination, the rise of the New Deal and government social programs, the Civil Rights Movement and desegregation, the Vietnam War, Nixon and Watergate, gay and lesbian rights, immigration, and the rise of a mediated culture. Leeman and Duffy have carefully selected the most eloquent and relevant speeches by African Americans, including those by Sojourner Truth, Frederick Douglass, Frances Ellen Watkins Harper, Ida B. Wells-Barnett, Booker T. Washington, Mary Church Terrell, W. E. B. Du Bois, Marcus Garvey, Martin Luther King Jr., Malcolm X, Stokely Carmichael, Barbara Jordan, Jesse Jackson, and Marian Wright Edelman, many of which have never received significant scholarly attention. The Will of a People is the first book to pair the full texts of the most important African American orations with substantial introductory essays intended to guide the reader’s understanding of the speaker, the speech, its rhetorical interpretation, and the historical context in which it occurred. Broadly representative of the African American experience, as well as what it means to be American, this valuable collection will serve as an essential guide to the African American oratory tradition. Richard W. Leeman, professor of communication studies at the University of North Carolina at Charlotte, is the author or editor of five books, including African-American Orators: A BioCritical Sourcebook (1996) and (with Bernard Duffy) American Voices: An Encyclopedia of Contemporary American Orators (2005). He has received several awards, including the American Forensic Association's Daniel M. Rohrer research award, and has served as a scholar-in-residence for an NEH-sponsored summer seminar on African American oratory. Bernard K. Duffy, professor of rhetoric in the Communication Studies Department at California Polytechnic State University, San Luis Obispo, is the author or editor of six books, including American Orators of the Twentieth Century: Critical Studies and Sources (1987), and has been co-editor/advisor of 32 books on individual American orators published by Greenwood Press. Cost is $49.95 in paper. Additional information: 0-8093-3057-1, 978-0-8093-3057-7, 474 pages.